Ever since a civil war brought down Somalia's last functional government in 1991, the country's 3,330 km (2,000 miles) of coastline  the longest in continental Africa  has been pillaged by foreign vessels. 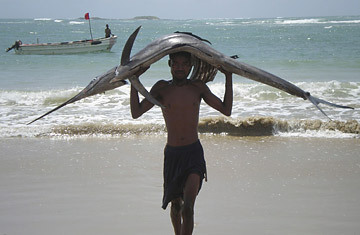 A United Nations report in 2006 said that, in the absence of the country's at one time serviceable coastguard, Somali waters have become the site of an international "free for all," with fishing fleets from around the world illegally plundering Somali stocks and freezing out the country's own rudimentarily-equipped fishermen. According to another U.N. report, an estimated $300 million worth of seafood is stolen from the country's coastline each year. "In any context," says Gustavo Carvalho, a London-based researcher with Global Witness, an environmental NGO, "that is a staggering sum." In the face of this, impoverished Somalis living by the sea have been forced over the years to defend their own fishing expeditions out of ports such as Eyl, Kismayo and Harardhere  all now considered to be pirate dens. Somali fishermen, whose industry was always small-scale, lacked the advanced boats and technologies of their interloping competitors, and also complained of being shot at by foreign fishermen with water cannons and firearms. "The first pirate gangs emerged in the '90s to protect against foreign trawlers," says Peter Lehr, lecturer in terrorism studies at Scotland's University of St. Andrews and editor of Violence at Sea: Piracy in the Age of Global Terrorism. The names of existing pirate fleets, such as the National Volunteer Coastguard of Somalia or Somali Marines, are testament to the pirates' initial motivations. High-seas trawlers from countries as far flung as South Korea, Japan and Spain have operated down the Somali coast, often illegally and without licenses, for the better part of two decades, the U.N. says. They often fly flags of convenience from sea-faring friendly nations like Belize and Bahrain, which further helps the ships skirt international regulations and evade censure from their home countries. Tsuma Charo of the Nairobi-based East African Seafarers Assistance Programme, which monitors Somali pirate attacks and liaises with the hostage takers and the captured crews, says "illegal trawling has fed the piracy problem." In the early days of Somali piracy, those who seized trawlers without licenses could count on a quick ransom payment, since the boat owners and companies backing those vessels didn't want to draw attention to their violation of international maritime law. This, Charo reckons, allowed the pirates to build up their tactical networks and whetted their appetite for bigger spoils. In the meantime, Somali piracy has metastasized into the country's only boom industry. Most of the pirates, observers say, are not former fishermen, but just poor folk seeking their fortune. Right now, they hold 18 cargo ships and some 300 sailors hostage  the work of a sophisticated and well-funded operation. A few pirates have offered testimony to the international press  a headline in Thursday's Times of London read, "They stole our lobsters: A Somali pirate tells his side of the story"  but Lehr and other Somali experts express their doubts. "Nowadays," Lehr says, "this sort of thing is just a cheap excuse." The legacy of nearly twenty years of inaction and abuse, though, is far more costly.